Yamaha Factory Racing is delighted to support Yamaha Indonesia Motor Manufacturing (YIMM) and join in launching the new 115cc Yamaha Jupiter Z1 scooter. From the Mugello Grand Prix onwards both Jorge Lorenzo, Ben Spies and the Factory Racing Team members have chosen to use the Jupiter Z1 as their new paddock transport. 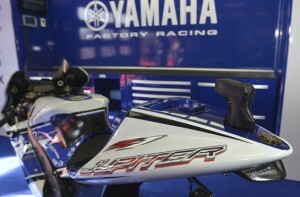 To mark the launch the Jupiter Z1 logo will be added to the leathers of both Factory riders and will also be seen on the tail of the 2012 YZR-M1.